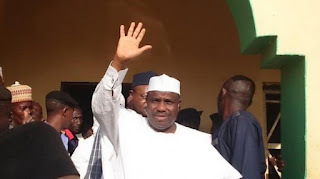 Aminu Tambuwal, governor of Sokoto, has been confirmed as the governorship candidate of the Peoples Democratic Party (PDP) in the state. Festus Okoye, national commissioner and chairman, information and voter education, Independent National Electoral Commission (INEC), made the confirmation while speaking with New Telegraph,. Tambuwal’s name was reportedly missing from the list released by INEC for the 2019 governorship election. Manir Dan’iya was said to have been listed as the governorship candidate of the PDP. However, Tambuwal has now been confirmed to bear the flag of PDP, while Dan’iya has been named as his running mate. “Now, as you are aware, by the provisions of Section 35 of the Electoral Act 2010 (as amended), a candidate validly nominated by a political party may withdraw his candidature by a notice in writing, signed by him and delivered by himself to the political party that nominated him for the election and such a political party shall convey his withdrawal to the INEC,” Okoye reportedly said. Tambuwal had contested and lost the PDP presidential primary to former Vice-President Atiku Abubakar. He had, in August, dumped the All Progressives Congress (APC) for the PDP. On Wednesday, Ahmed Sokoto, his deputy, resigned his position for reasons not unrelated to Tambuwal’s defection.